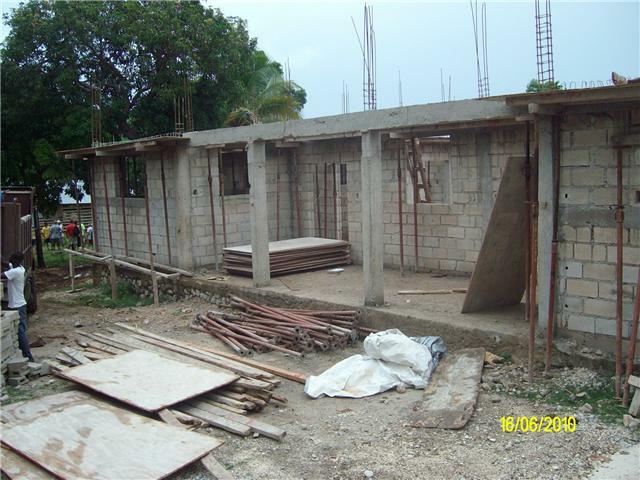 Thought I would post some pictures I took yesterday of the church camp in Peredo and show some of the progress. This is the building that houses the generator. This is a huge generator and will power the entire camp grounds, clinic, school and church. For those of you who have been here before it is located to the right of the church building if you are looking towards the front of the church. It sits between the church and clinic. This is the old depot to the left and the new addition to the depot on the right. Bigger door for the gator that was donated to Haitian Christian Outreach! The very first depot at the camp was washed away by the hurricanes in 2008. Now is is rebuilt, bigger and protected by a wall to re-route water away from the camp property. This is the 1rst dorm room to the left of the depot if you are looking at the depot. Last week they added windows and a door! The bathrooms in the back are all blocked in and ready for toilets and showers. This dorm room looks awesome! Right now it is being used as a depot until the new addition to the depot is finished. And finally...drumroll please....the clinic! It is located to the immediate right of the church if you are facing the church. It will be such a blessing to the people of this area when completed. Thank you for your support of the camp and clinic building process through Haitian Christian Outreach in Haiti. Things are coming together and it is really starting to look like campgrounds and clinic! Great pictures!! God bless your efforts!